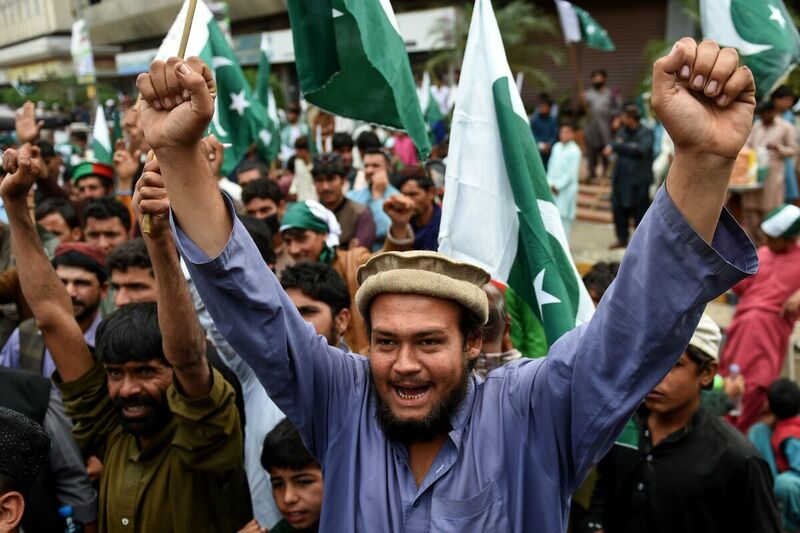 Pakistan's Long Support For Militants Puts The Country In A Bind Pakistan has long supported militants fighting to its east in India and to its west in Afghanistan. The country says it's cracking down on militants, but many critics are skeptical. 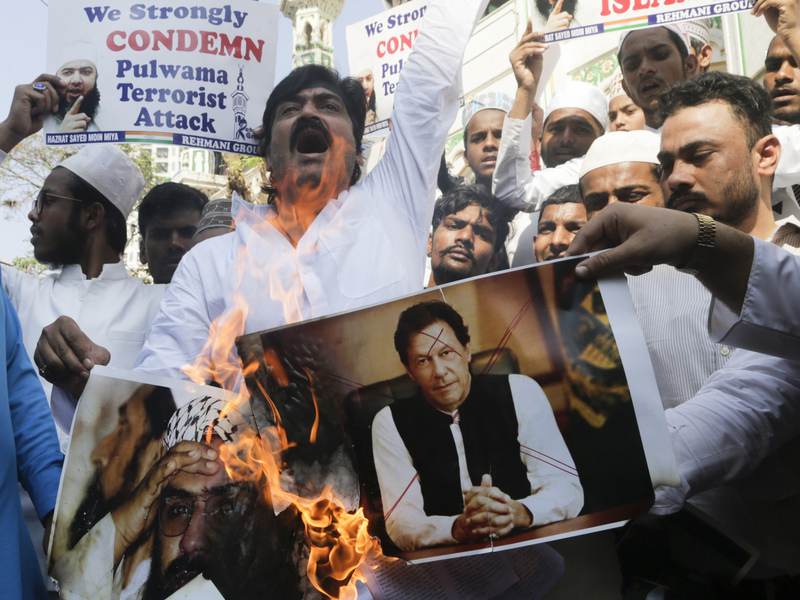 Indian protesters in Mumbai burn posters of Pakistan's Prime Minister Imran Khan during a demonstration against the Feb. 14 attack that killed more than 40 Indian policemen in the Kashmir region. The bombing was carried out by a young Muslim man who grew up in Indian-administered Kashmir, and Pakistan says it had nothing to do with it. Pakistan has also arrested dozens of suspected militants in recent days, in an effort to show it's cracking down at home. However, Pakistan is facing great skepticism abroad. Pakistan has long hosted the radical group that claimed responsibility for the attack, Jaish-e-Mohammed, even though the Pakistani government has officially outlawed the group, which is designated a terrorist group by the United Nations and the United States. And here's the larger context: Pakistan has backed militants in its neighboring states of India and Afghanistan for decades, and while Pakistan's exact role is often murky, it is now paying an increasingly heavy cost for this policy. "It has become clearer, I think, to the Pakistani authorities that this policy is now really not giving any dividends," Pakistani author Ahmed Rashid, who has covered the region's conflicts for many years, said in an interview from Lahore, Pakistan. Pakistan's Prime Minister Imran Khan, who took office last year, is facing a host of major challenges. Pakistan is again in financial trouble, in urgent need of an international bailout. The country is engaged in a tense standoff with India and has alienated its most important ally, the United States. In stark contrast, Pakistan and the U.S. had a very successful partnership in the 1980s, when they jointly backed Afghan rebels who drove the Soviet army out of Afghanistan in 1989. It was a stunning triumph. Flush with this victory, Pakistan tried to replicate this model in its feud with India over Kashmir, the Himalayan territory divided between the two countries. Pakistani demonstrators hold national flags and shout slogans during an anti-Indian protest in Karachi on March 3.Tensions have been running high between India and Pakistan for the past month and the two sides have been trading fire in the disputed Kashmir region. "The Pakistanis suddenly realized that they had this ready-made resource of the jihadi culture, the training grounds, and facilities and the weaponry to be able to train people to infiltrate into Kashmir," said Shuja Nawaz, who's with the Atlantic Council in Washington, D.C., and the author of a forthcoming book on how the U.S.-Pakistan relationship went sour. "The initial thinking was that this was a strategic gambit which would allow Pakistan, which was a much smaller military and much smaller economy, to continue to keep India occupied in Kashmir," he said. Kashmir remains a flashpoint. Since the Feb. 14 suicide bombing, India and Pakistan have traded airstrikes and artillery across the Line of Control, the de facto border that divides Kashmir. In Afghanistan, meanwhile, Pakistan helped launch the Taliban in the 1990s, as that country descended into civil war. The Taliban seized power in 1996 and then hosted Osama bin Laden and al-Qaida. After al-Qaida attacked the U.S. in 2001, the U.S. military invaded Afghanistan, but soon became frustrated with Pakistan. The Americans have often described Pakistan as playing a double game — sometimes following through on a promise to help fight terrorism, while also providing safe havens for extremists along Pakistan's western border. The U.S. found and killed bin Laden deep inside Pakistan in 2011 and other al-Qaida leaders have been found hiding in Pakistan. For years, the U.S. carried out drone strikes directed at militants who had sought refuge in western Pakistan. 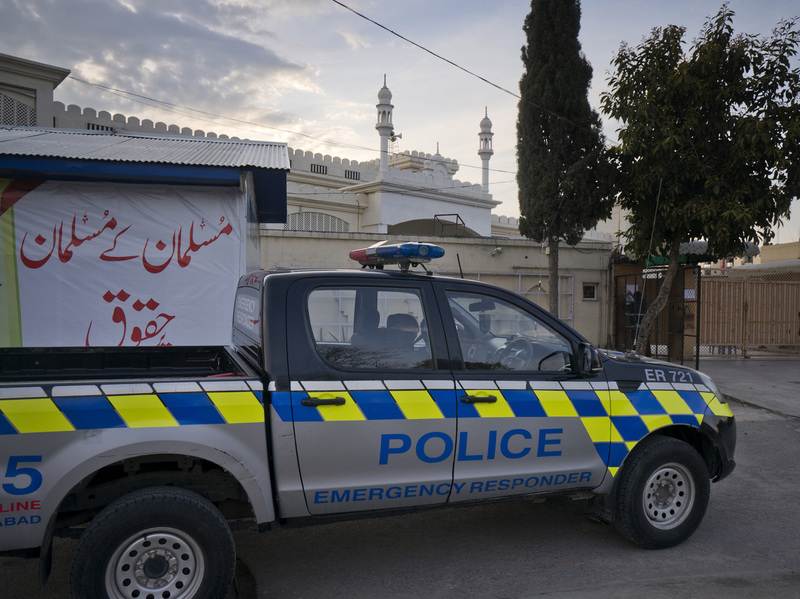 A police vehicle is parked outside a mosque belonging to a banned religious group in Islamabad, Pakistan. Prime Minister Imran Khan has ordered the takeover of assets and property of dozens of militant organizations who continue operating in Pakistan. As Washington attempts to negotiate a peace deal in Afghanistan, the U.S. is again calling on Pakistan to help calm down and not inflame the region. Moeed Yusuf, an analyst at the U.S. Institute of Peace, recently questioned Pakistan's ambassador about the country's support of militants. "Isn't the finger again and again being pointed at Pakistan because of these groups? Isn't it even more necessary that this chapter close once and for all?" Yusuf asked in an event at the institute. Khan responded with a sweeping claim: "There is no organized presence of any terrorist group in Pakistan," he said, adding that Pakistan has lost tens of thousands of its own citizens to extremists seeking to bring down the Pakistani government. But Pakistan's reputation for supporting militants is deeply ingrained, and will not easily be shed. President Trump last year suspended military aid to the country on the grounds that it wasn't doing enough to fight terrorism. International opinion has been more sympathetic to India in the current crisis. Rashid says Prime Minister Khan has good relations with the country's powerful army and is showing signs he's willing to crackdown on militants. "There is now a recognition that these groups are in a way, out of control, that Pakistan has to arrest these leaders, curtail their activities and dismantle these groups." Pakistan has made this pledge before, but has yet to deliver.